The Swisher 4.4HP (160cc) log splitter features a powerful Honda engine to ensure optimal performance. 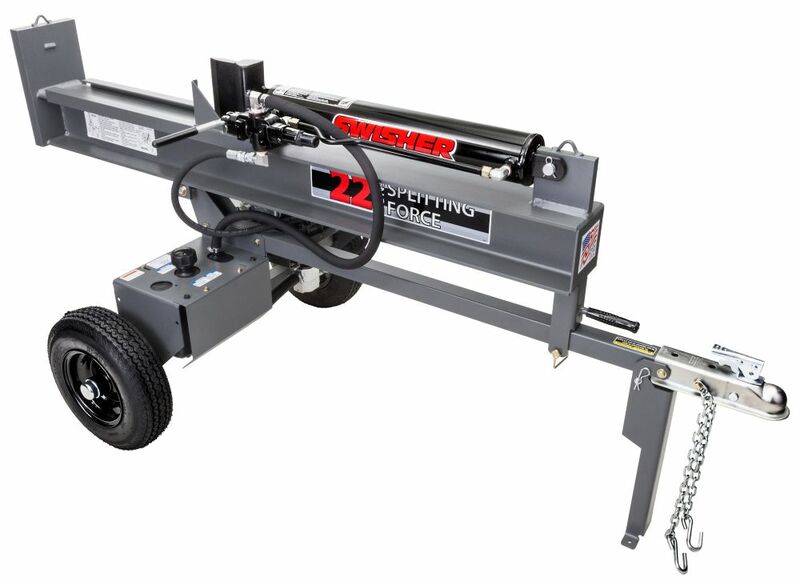 The splitter offers 22 Tons of splitting force and a 13 second cycle time. The heavy-duty 2-stage pump provides maximum splitting performance. The splitter can function in both horizontal and vertical splitting positions. The log cradles reduce the chance of the log rolling off the beam. Easily transport your splitter anywhere you want to go...it's road towable. Other features include: 25-Inch opening, 2.5 gallon protected poly hydraulic tank, and a log stripper. Cradles aid in securing logs during splitting, log stripper separates log from wedge if complete split is not accomplished, vertical beam lock adds security while splitting in vertical position. Help protect your log splitter and prolong the life of the engine. The Ariens Log Splitter Engine Cover is designed to protect your engine while your machine is not in use. This heavy-duty Country Pro 30-ton gas log splitter, splits wood using a powerful 250cc Briggs and Stratton engine. It will split logs up to 26 inch long and features a built-in log cradle using an 8 inch hardened steel wedge. The splitter operates in both the vertical and horizontal positions and has a short 13.5-second cycle time. The splitter also features an auto return valve, 14GPM two stage pump, a 2 inch ball coupler for easy towing and 16 inch DOT approved pneumatic tires for hauling down the highway. Some assembly is required, and the hydraulic oil is sold separately. Lifan Power Equipments core business is our Industrial Grade Horizontal Shaft Engines. Our OHV (over head valve) design offers cool and fuel efficient operation. The engines are manufactured with a cast Iron cylinder sleeve and bore, which results in longer engine life. They also come equipped with Heavy-Duty ball bearing support crankshafts. All Lifan engines have automatic decompression for easy recoil or electric start, to negate backlash. The Fuel tanks are equipped with a built-in strainer to avoid trash getting into the fuel system. Equipped with dual throttle cable attachments, our engines are ready for every application. The Universal Mounting Bolt Patterns allow for replacement of almost all other brands of engines. Compatible with lawn tractors, agricultural equipment, pressure washers, log splitters, and hundreds of other applications. Ideal where 13 HP horizontal shaft power is required. We stand behind out 1 year Commercial and 3 year residential Warranty. 22 Ton Direct Drive Log Splitter with 4.4 HP Honda Power The Swisher 4.4HP (160cc) log splitter features a powerful Honda engine to ensure optimal performance. The splitter offers 22 Tons of splitting force and a 13 second cycle time. The heavy-duty 2-stage pump provides maximum splitting performance. The splitter can function in both horizontal and vertical splitting positions. The log cradles reduce the chance of the log rolling off the beam. Easily transport your splitter anywhere you want to go...it's road towable. Other features include: 25-Inch opening, 2.5 gallon protected poly hydraulic tank, and a log stripper. 22 Ton Direct Drive Log Splitter with 4.4 HP Honda Power is rated 5.0 out of 5 by 1. Rated 5 out of 5 by Clumsyfingers from This thing will split ANYTHING! There is nothing that I've thrown at this thing that it won't split. Knots, burls whatever. It just kinda grunts a bit then pop! Normal 12" diameter logs are like cheese. You can keep 2 or 3 people busy splitting and stacking.